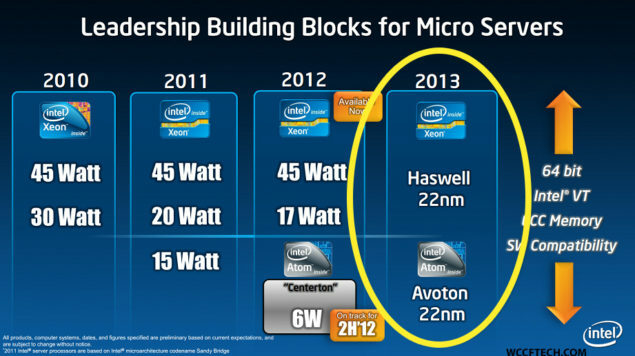 Intel Avaton is the 22nm Atom Processors targeted towards the low power server market. The Intel Avaton CPU SKUS have been revealed and will feature upto 8 cores in a System-on-Chip (SoC). 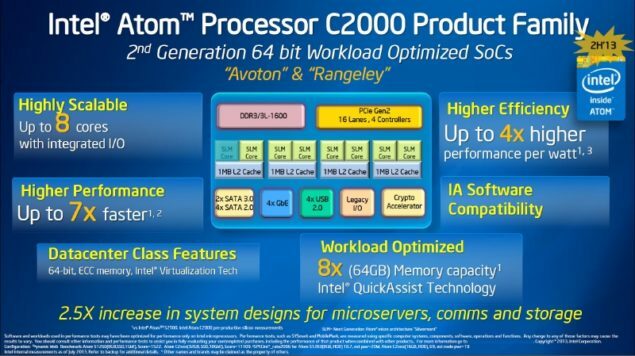 Th Intel Avaton CPUS will be based on the Silvermont architecture and are expected to debut somewhere around Q3 2013. The designated prefix for Intel Avaton is C. Intel Avaton will have 5 SKUS at Launch namely C2350, C2530, C2550, C2730, and C2750. They will have upto 4MB of L3 Cache and will have the SSE4 and AES instruction set. C2350 – The ‘0’ depicts the intended micro servers target. Intel Avaton (Atom) C2730 and C2750 are Octa Cores OR the C2730 is a Hexa Core. This should be a pretty obvious thing but we will say it anyway. The last generation TDP was of 6W ( Centerton) and the Avaton TDP should be lower, probably 4W. This is one of the main reasons the Avaton SoC can succeed. Because of such low TDP a Low Power server cluster can employ CPUS by the dozen without getting overwhelmed by electricity bills. They will provide a highly power efficient and focused cluster with a formidable processing power. The Intel Avaton (Atom) has the Silvermont micro architecture and this should help its processing efficiency as well. Now Read: Intel Atom Cherry Trail and Bay Trail Revealed – Feature Broadwell GPU Architecture.